Avoid toxic chemicals and save money with this super quick and easy DIY Beauty tutorial. This Homemade Toner is made with just 3 ingredients that soothe, clean and refresh your skin! **This post first appeared January 2016. It was updated September 2017 to reflect new information, money-saving recommendations, and new photos and a video. 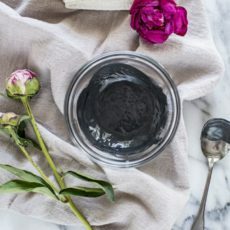 We kicked off the DIY beauty game here with makeup remover, so I thought it only made sense to follow that post with the product I use after I take off my makeup: a quick and easy Homemade Toner. So why would you even want to make your own toner? **Note: The products shown above are Proactiv Revitalizing Toner, L’Oreal Paris HydraFresh Alcohol-Free Toner, Neutrogena Alcohol-Free Toner, Clinique Clarifying Lotion 2 and Murad Acne Clarifying Toner. Diazolidinyl urea is a formaldehyde releaser. Formaldehyde is rated a 10 (the highest rating) by EWG’s Skin Deep as it’s a known carcinogen. Three of the products above contain parabens, one of which is rated a 7 by EWG’s Skin Deep as it’s proven to mimic estrogen and cause reproductive and developmental disorders, with a link to breast cancer. Fragrance is rated an 8 by EWG’s Skin Deep, as it’s a proven human immune system toxicant and one of the top five allergens in the world. As if that weren’t enough, because federal law doesn’t require companies to disclose what’s in their fragrance mixture (it’s considered a trade secret), companies are able to use all sorts of harmful chemicals, like phthalates (these chemicals mimic human hormones and are known to cause birth defects, lower sperm count, thyroid issues and even cancer), in their fragrance without having to disclose it to the consumer. Though some fragrance mixtures may be safe, since we can’t know exactly what’s in it, I try to avoid anything with “Fragrance” listed in the ingredients to be safe. 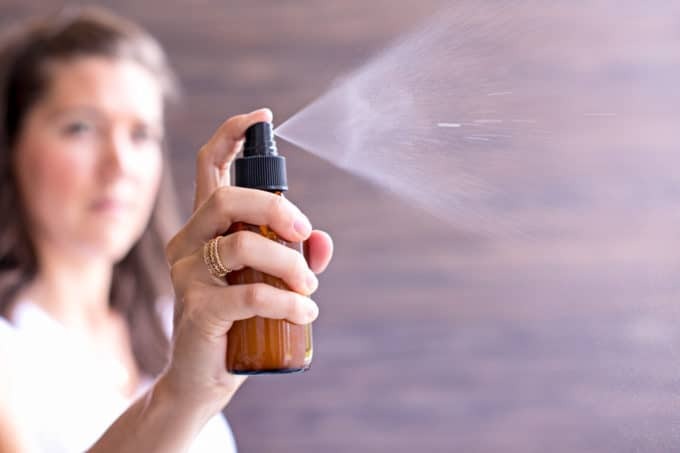 Three of the products above contain synthetic colors and dyes, many of which are derived from coal tar and are known for their carcinogenic properties. They’re also heavily tested on animals, which can be an issue for those concerned about animal rights. 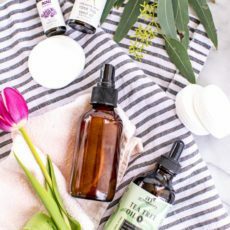 Another reason I believe in making your own DIY beauty products (especially when it’s just as easy and convenient as buying something) is because of the sheer number of chemicals found in store-bought items. Some of you may be thinking, “I don’t use that many products, so I don’t feel like this affects me as much.” I used to feel that way, too. But then I realized that even if you just use 10 products a day (which let’s be honest, after you shampoo and condition your hair, wash your body and face, apply deodorant, and brush your teeth, you’re already up to 6 products and that’s before you even apply any makeup), if each of those products contains even just 15 ingredients, then that’s 150 ingredients you’re putting on your body every single day. 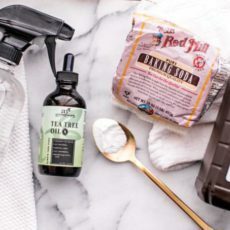 Fortunately, my recipe for homemade toner is just 3 simple and natural ingredients–you likely even have them in your pantry/medicine cabinet already (if you don’t, I’ve included links to my favorite products you can buy on Amazon in the recipe below)–and it’s just as effective as any store-bought brand. Meaning, this Homemade toner is BEYOND cheap, too! 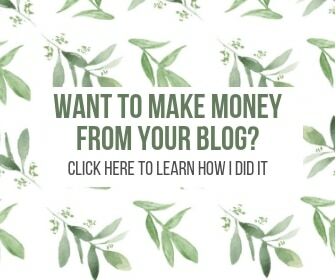 Compare that to $30 per bottle of Clinique’s toner, $20 per bottle of Proactive toner or even $5-$15 per drugstore brand toners and you really can’t afford not to make your own toner. You can mix and match some essential oils with this toner base, as well, depending on your skin’s needs. 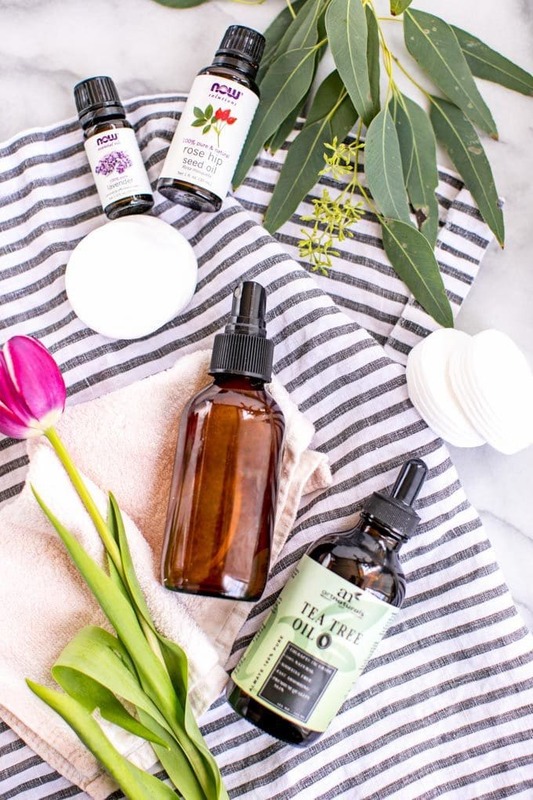 If you’re looking for a homemade toner recipe for acne, oily or blemish-prone skin, try adding Frankincense and Tea Tree Oil. Or if you need a homemade toner recipe for dry or sensitive skin, Lavender and Ylang Ylang are incredibly calming. Just add a few drops, depending on your skin type, which will also help mask the vinegar scent. Don’t worry, the scent is mild and it goes away after 15-30 seconds. Or you can leave the toner at just these 3 ingredients core ingredients (acv, rosewater and witch hazel) and expect clean, fresh skin after every swipe! 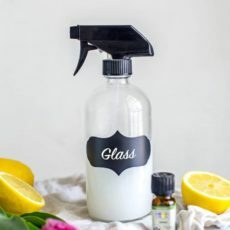 To use this Homemade Toner, simply shake the bottle before each use and either spritz directly onto your face or spray onto a cotton pad and apply. You’ll want to apply after you’ve cleansed but before you moisturize for the best results, although a few spritzes throughout the day is incredibly refreshing! 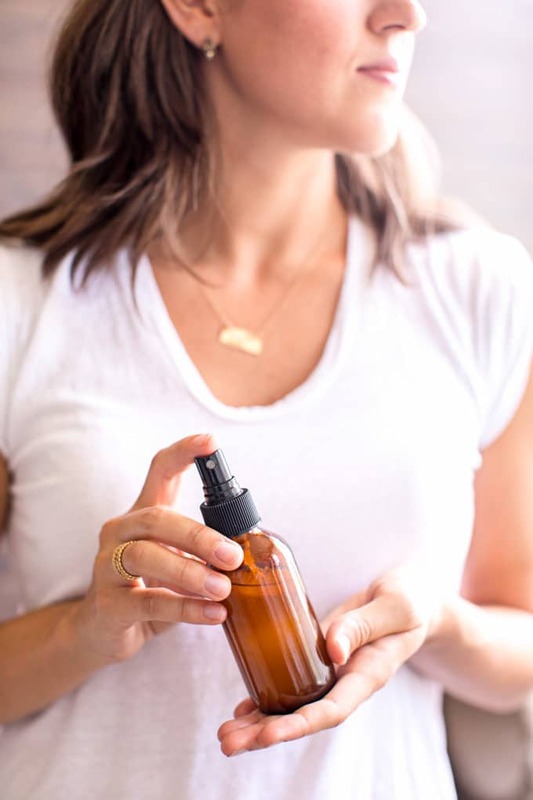 If you try this homemade toner recipe, be sure to share a photo and tag me @rootandrevel on social media–I’d LOVE to see how it turned out for you! In a small bowl, combine all ingredients and gently stir. Shake before each use. 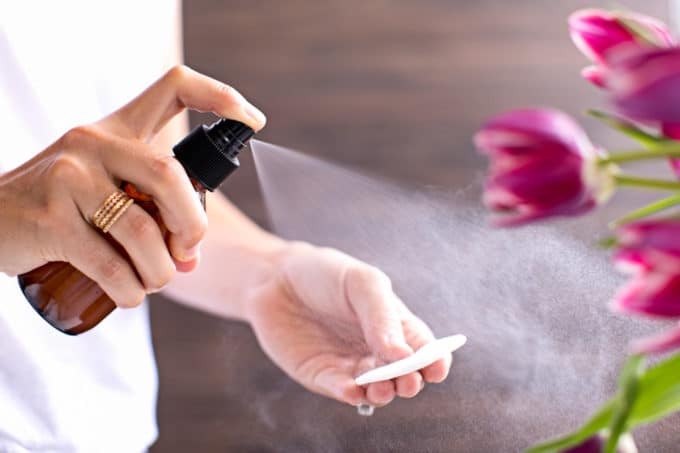 Spritz 3-4 sprays onto a cotton pad and apply to clean skin (after cleansing, but before moisturizing). This recipe should last for at least 6 weeks of twice daily applications. Thank you for this! 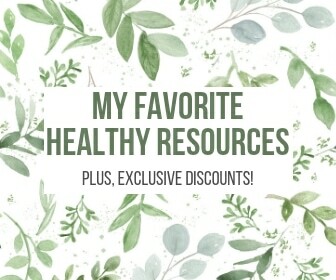 I did have to replace the ACV with distilled water as well ( unfortunately I get horrible, painful bumps around my chin and mouth from ACV) I am loving all the DIYs on here and have tried/am trying all of them! 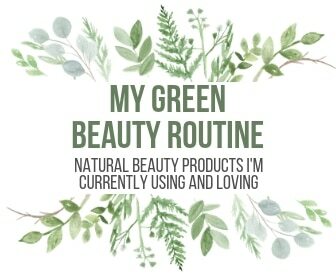 Trying to cut out chemicals in my life and am finding that natural works better a lot of the time (eye makeup remover!). Thanks again! The vinegar ruins this! At first the mixture smells lovely. After a day or so, the vinegar overpowers the rose water and essential oil aroma. Also, the mixture is very harsh and drying. I will not be using this recipe again. Sorry it didn’t work for you! Everyone has different skin and some things work for some and not for others. Thanks for sharing your tweaks – so glad it works well for you! Such a cute video! 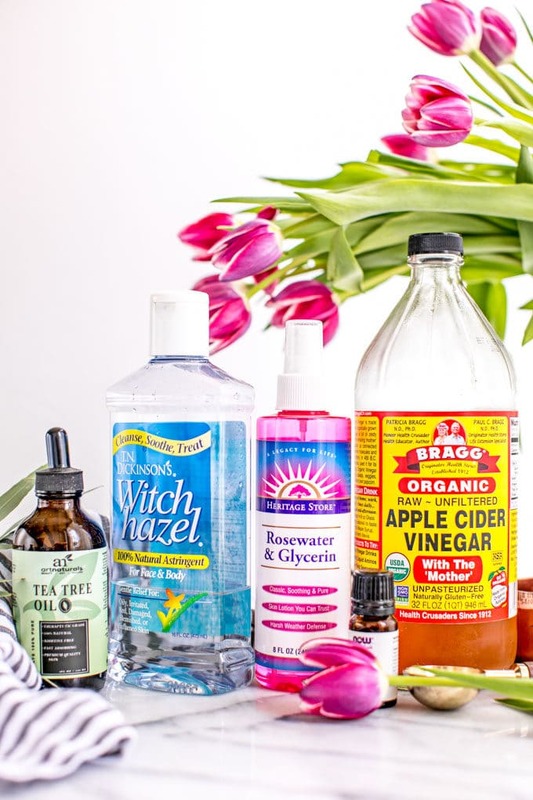 🙂 I’ve been using just witch hazel as a toner these last couple years, but you’ve inspired to make my own now as I imagine the rose water, tea tree oil and apple cider combo with it would be more nourishing for my skin! Thanks! Thanks for sharing why the toxic chemicals used in commercial products are detrimental to our skin and our health. With all the marketing messages that we are bombarded with, touting that this “new” formula is better, going back to the basics is what is actually healthful for us, so thank you! I now use this twice a day. 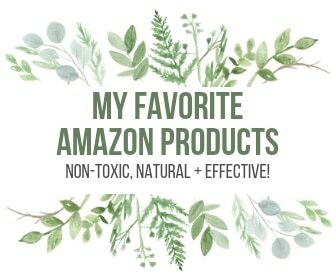 Not only does it save me SO much money…it’s so much better for my skin.